25% off your first ride! South Shore to Logan Airport our specialty. with luxurious and entertaining experiences! 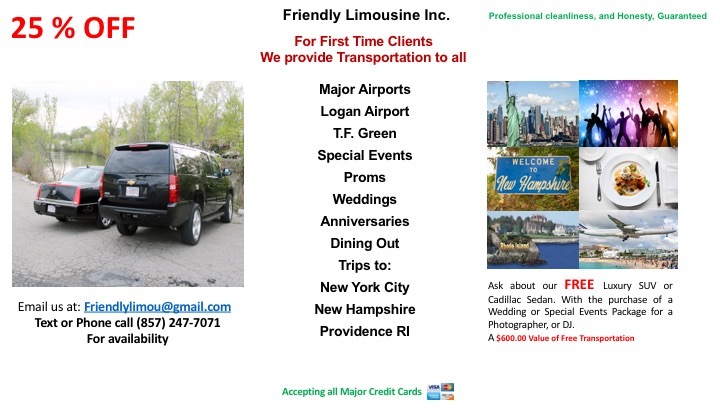 Serving all airports long distance and special occasions. 25 Years of Driving experience and Driver Training. Safe transport through Major Storms, 1 Million Dollars of Insurance. Call to schedule: 857 247 7071, 7:00am – 10:00pm. Text or email anytime. email: friendlylimou@gmail.com, we welcome your feedback. Luxury Norwood Taxi service is dedicated to safe, professional, courteous and efficient taxicab service. We go the extra mile to ensure that each and every customer has a pleasant and timely trip. Your safety is our top concern. One Million Dollars of Insurance Coverage. Classy Suburban SUV and Cadillac DTS vehicles. Luxury Norwood Taxi is equipped with a dispatching system and GPS which allows almost instantaneous transmission of your request. We are dedicated taxi drivers serving Norwood, surrounding towns, Boston and all areas in MA with luxurious quality transportation. We are dedicated to safe, professional, courteous and efficient taxicab service.